Tacoma Art Museum entry facade scrim. 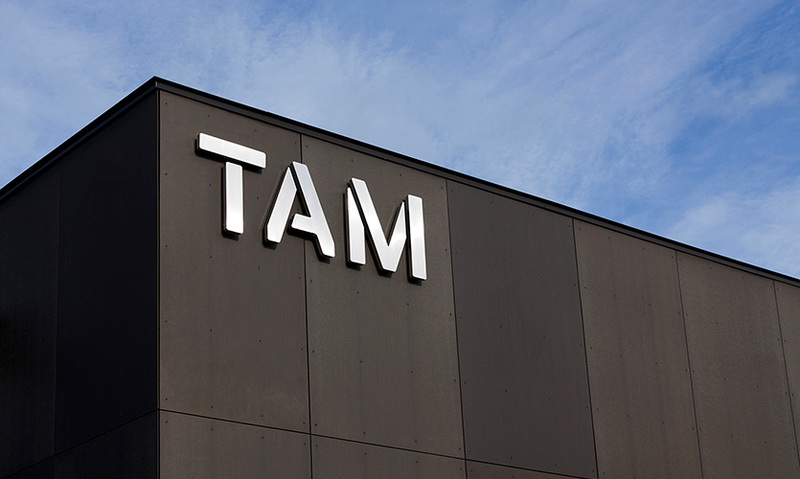 Tacoma Art Museum logo using the custom Alpha TAM typeface. Tacoma Art Museum parking level signage. Tacoma Art Museum entry area poster set. Tacoma Art Museum interior directional signage. Tacoma Art Museum street-front illuminated event kiosks. 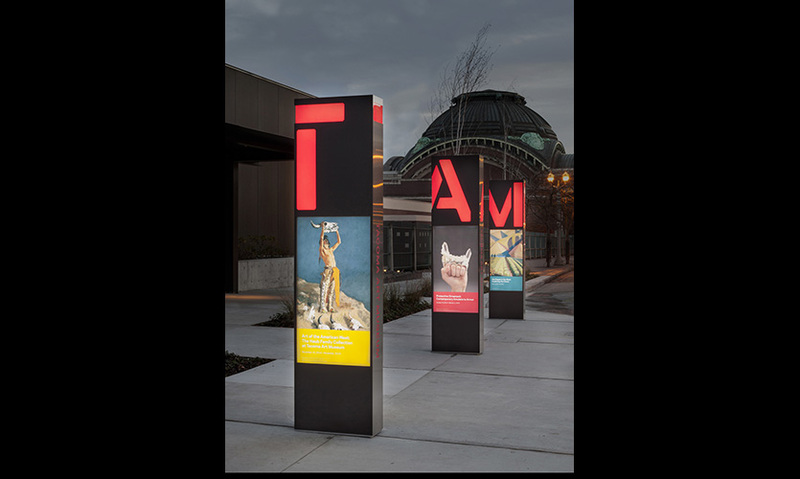 When Tacoma Art Museum nearly doubled their exhibition space with an expansive new wing of Western Art, they commissioned Studio Matthews to create new signage and wayfinding inside and out. The scope contained a family of logos, with brand guidelines, as well as various brand applications including t-shirts, buttons, bags; the Alpha TAM custom typeface; major building exterior and entrance signage; a series of exterior poster kiosks; exterior building exhibition banners; and exterior and interior wayfinding. The scope also included a custom interior magnetic poster display system with poster designs; donor plaques; two donor walls (for the original building and the new wing); parking signage; TAM Cafe and TAM Store signage and related collateral. 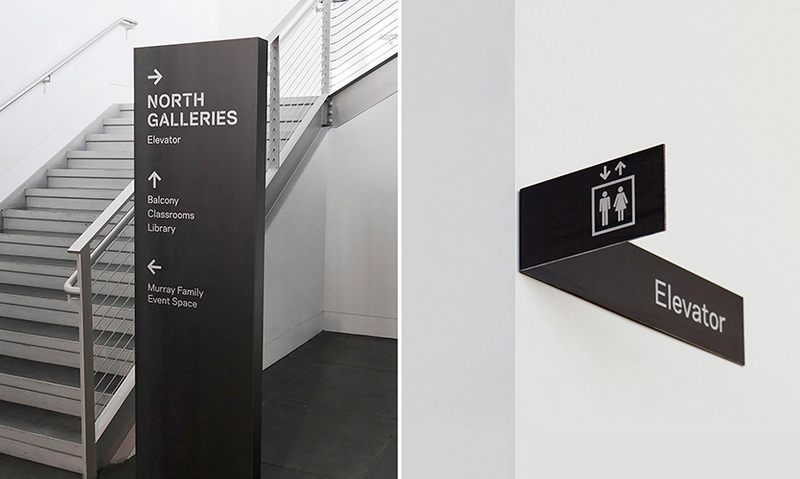 As the signage and wayfinding concepts came together, the design team was also awarded the opportunity to rebrand the Museum. 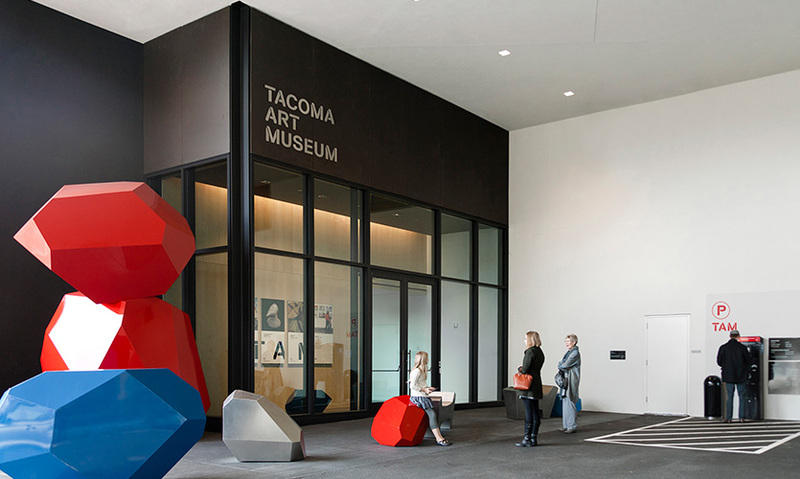 They developed a suite of logo configurations to provide the organization with greater flexibility: “Tacoma Art Museum” along with “TAM”— the nickname bestowed on the museum for many years. Despite its prominent location, the original Museum suffered from low visibility. Its opaque exterior and minimal signage meant that it was often missed completely, or mistaken for a convention center. The Museum wanted to increase its visibility and create a more pedestrian-friendly, open relationship to the street. 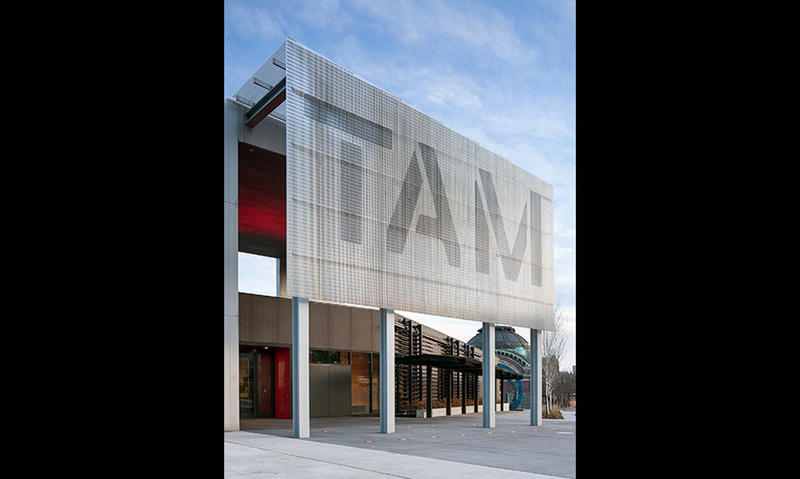 Studio Matthews integrated the name directly into the large architectural canopy that links the old and new wings, announcing the new TAM to both cars and pedestrians. Only the front edges of the steel grate are painted, creating a shifting, mercurial logo as one moves past the canopy. 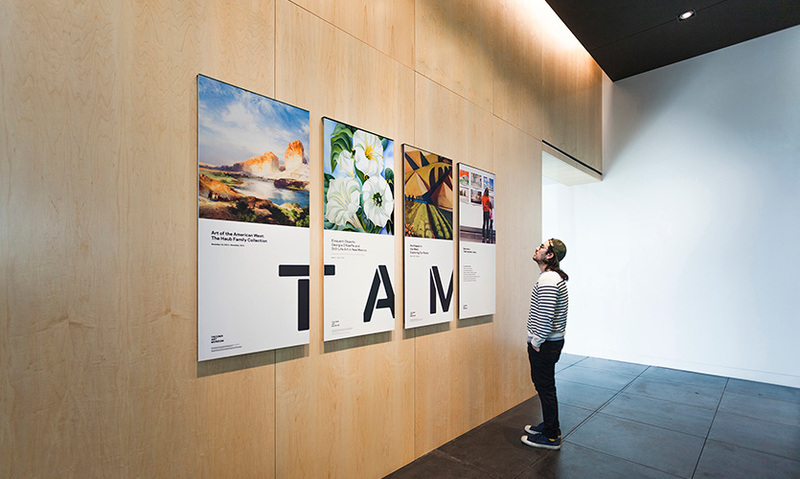 At street level, a series of poster kiosks serve double duty: naming the building and also providing changing display space to promote current exhibitions. The red type and the posters light up at night. One side of the kiosks is clad in stainless steel while the other is clad in dark brown Richlite, tying to the building’s old and new wings. Studio Matthews’ material palette referenced both the original building—Antoine Predock’s modernist silver box—and the new wing by Olson Kundig Architects, which is clad in deep-brown Richlite, a locally fabricated industrial material. The bright stainless steel and the dark industrial steel integrate throughout the scheme with TAM’s iconic red brand color to unite the wings. 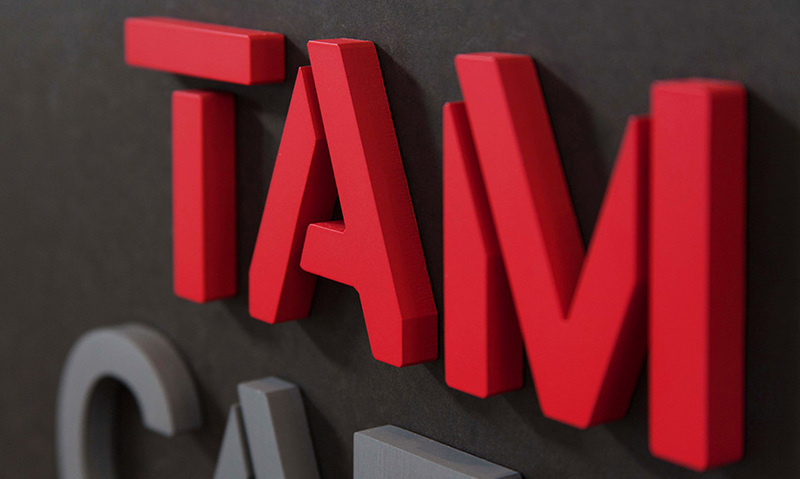 The injection of fresh typography and a rich material palette, combined with the punchy red that has always been part of TAM’s brand, invites in the visitor. The Studio Matthews team helped the Museum to significantly strengthen both its national and international profile, bringing in a much bigger and more diverse audience than ever before. 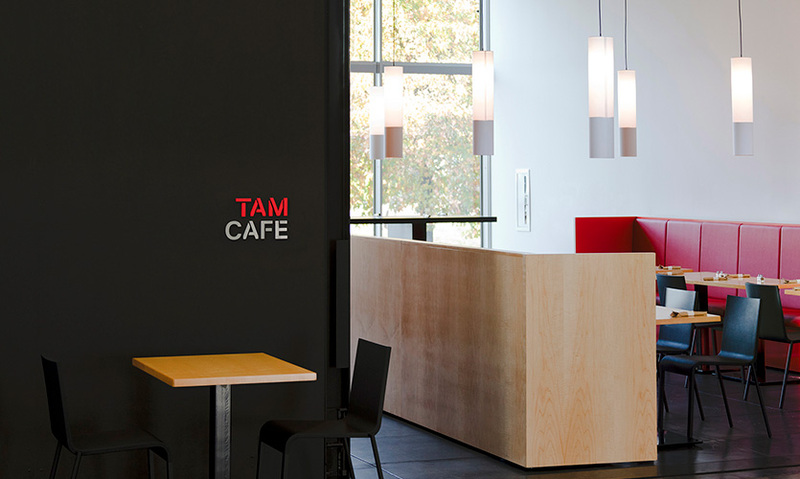 "It’s hard to not like the bold simplicity of TAM’s wayfinding and identity. Go ahead. Try to dislike this thing and see where it gets you. No really, go for it. Give up yet? Yes, I thought so. Big, bold, stenciled letters and tastefully placed messaging and signage win again." "The wayfinding, font design, and signage design at TAM do a wonderful job of complementing the modern aesthetic of the building. There are an elegant harmony and consistency across all components. This defines the space and allows, when appropriate in the case of promotional moments, to highlight the artwork."